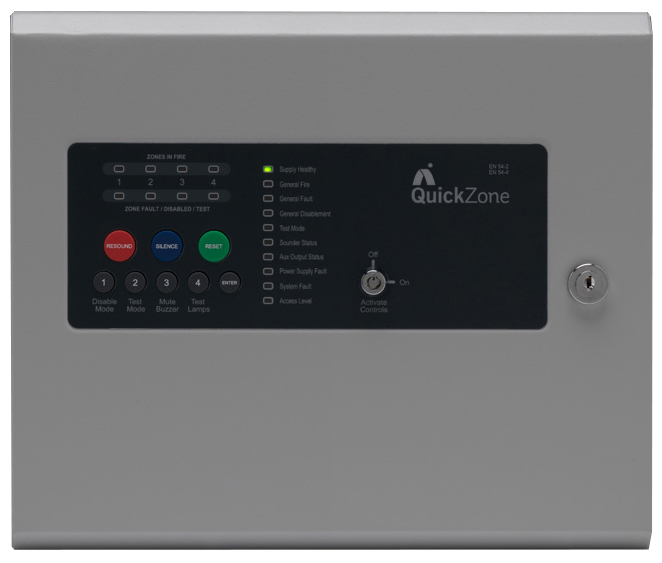 QuickZone is a 2 or 4 zone Conventional / Twin Wire (sav-wire) control panel with integral power supply & space for standby batteries. The panel continues the attributes of quality and reliability, that is easy to install, maintain, and is simple to operate for the end user. Two or four fire zone circuits are provided plus two monitored sounder circuits. Fire and fault VFCO relays, Fire & Fault switched negative outputs, class change and an alert input are also included. The fire zone outputs can be set as 'Twin Wire' by DIL switch selection. The DIL switches are also used to allow Zone interface setting and Access to Level 3 mode. In Level 1, the panel will indicate if there are any faults (Supply, Fire, System or General). As well as this, the panel is capable of indicating zones in Fire, Fault and disablements. Auxiliary Output and Sounder status will be shown including if the panel is in test mode. Controls enabled in Level 2 include Resound, Silence and Reset. Disable and Test modes can also be established at this level, as wll as muting the internal buzzer and testing the functionality of all the LED indicators. In access Level 3, it is possible to select sounder resound options for zones (EN54 requirement), select Type 'A' dependancy per, view and edit dependancy functions as well as restore factory settings. The buzzer volume can also be set. QuickZone panels support a large range of conventional detectors including Apollo, Argus, Hochiki & Nittan. 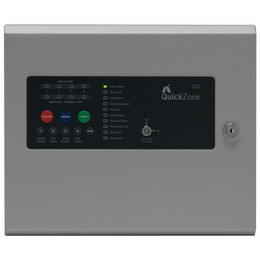 QuickZone panels are full approved to European Standards EN54-2 & 4, Fire detection and Alarm Systems - Control & Indicating Equipment. DIL selectable conventional or twin-wire (savwire) set up. Class change and alert inputs. 1 Amp switch mode PSU. Space for up to 3.2Ah batteries. Approved to EN54 2 & 4. Mains Supply : 230V 50Hz (+10%, -15% tolerance) 1.0A Max.